Hells Wives hit the road! 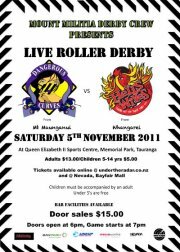 It’s the last game of our season and this weekend Hells Wives are hitting the road to play Mount Militia Derby Crew’s Dangerous Curves at Queen Elizabeth II Sports Centre in Tauranga! Forget about the fireworks ‘cos you don’t wanna miss these bangs and crashes people! This entry was posted on November 1, 2011 by nnderby. It was filed under EVENTS! and was tagged with Dangerous Curves, Hells Wives, Mount Militia Derby Crew, Northland Nightmares, Northland Nightmares Roller Girls, Northland Nightmares Roller Girlz, Roller Derby.